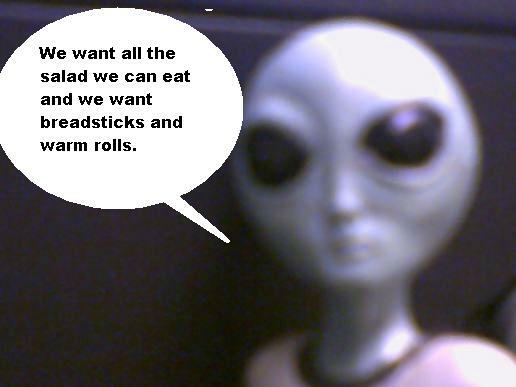 UFO Aliens living at AREA 51 since 1947 complain about The Olive Garden restaurant. 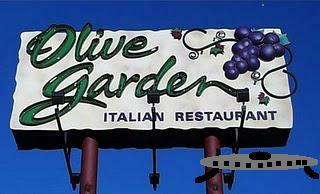 Home → Damien Zone → UFO Aliens living at AREA 51 since 1947 complain about The Olive Garden restaurant. They’ve been there since 1947 after their saucer crashed in the desert outside of Roswell, New Mexico and for the most part they have been quiet and helpful, but recently the “Grey 7” have started to complain about the food. “It all started when they built an Olive Garden Restaurant about 100 miles from the Alien Being Detention Center (ABDC), ” said Commander Lukas Hastings, 83, who has been with the aliens since he was a 20 year old private. “The guys come and go with all kinds of aircraft in and out of here and sometimes they bring in take-out food from the Olive Garden. “At first the aliens could only eat baby food and okra, but in 2008 their digestive systems finally adapted and they started to take a liking to take out food fit for humans. Okra is not fit for humans and we do not consider baby food to be fit for humans but we give it to babies because they don’t know any better. Funny thing is now that I am 83 and have IBS and BPA and DVT, I have to eat baby food. The aliens agree with Commander Hastings, but sald doesn’t seem to be their only gripe. Network Announces: "Real Housewives of Tehran" to air in January. Sarah Palin raps: "I'm texting Bristol. I got a pistol"